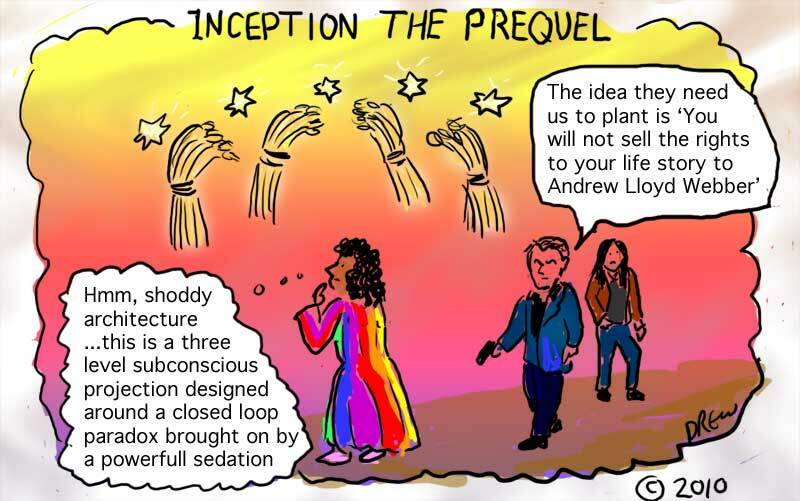 Todays cartoon is about Christopher Nolan's Inception and the`Biblical story of Joseph. I watched Inception for the first time last night (yes it has been out for ages so this is hardly topical) and really enjoyed it. This is despite certain work colleagues hyping it up since they saw it at the cinema. 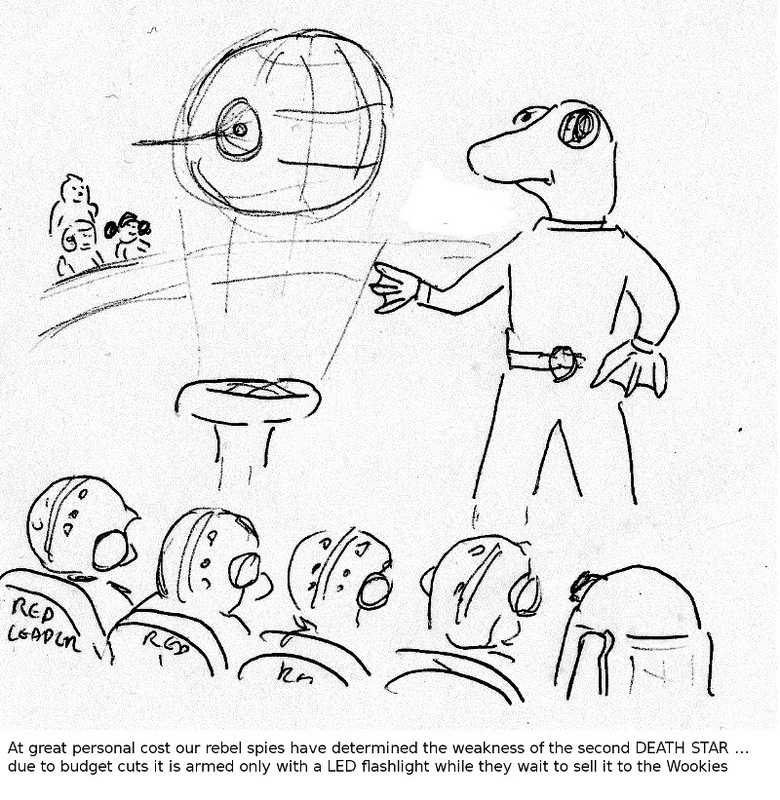 Like the film this cartoon raises many questions and paradoxes. Who wants to stop the production of Andrew Lloyd Webber's musical 'Joseph And The Amazing Technicolor Dreamcoat'? I saw Lee Mead as Joseph in London and even though I'm a guy I quite liked this piece of musical theatre. However for the purpose of this cartoon I needed a 'They'. I thought of an evil corporation like Cobol who in the Inception alternative reality not only are behind one of the oldest programming languages but hire Cobb's team to try and prevent a rival company dominating the world's energy markets and charging old women too much for their winter gas supplies. However I couldn't think of anyone so I left it a mystery like much of Inception. production. Maybe it was Agnes of Cleethorpes who disappointed with seeing an understudy in the regional tour offered a junior Cobb a tenner to undertake his first job. I'm sure the Internet will be awash with theories like those for Inception (heres a good summary of them). 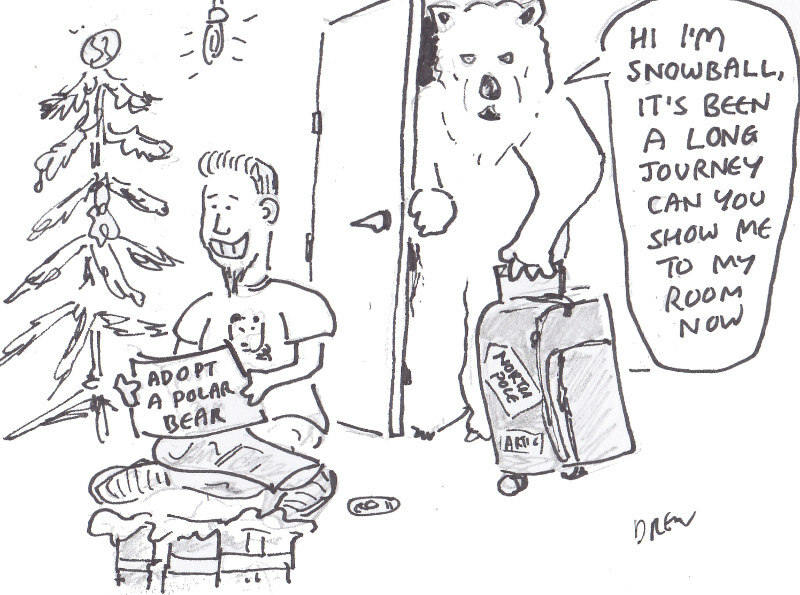 Back from the Christmas break with a cartoon about the unexpected consequences of Christmas presents in this case Adopting A Polar Bear. WWF (the World Wildlife Foundation not the fake wrestling mob) and others advertise Polar Bear Adoption as a gift which surely cannot be taken literally. There is a debate to be had as to whether polar bears really are in danger from melting Artic ice which is a debate I'm happy to avoid for the moment. 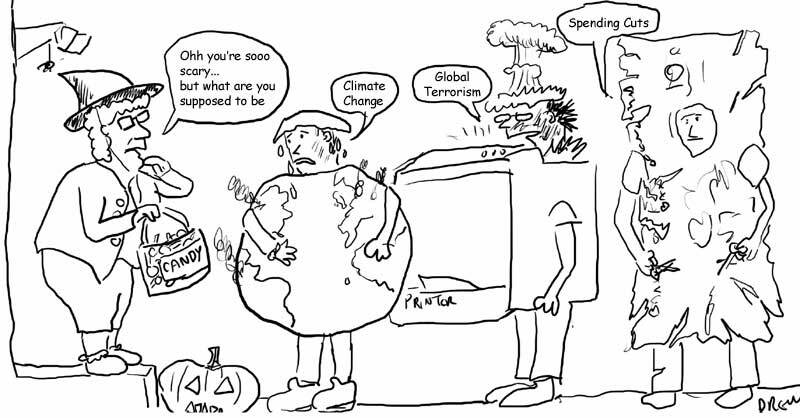 The fact is there are many cartoons that could be drawn about either side of the climate change debate both of which think of themselves as Dr Spocks of science dealing only in cold scientific fact while the opposing forces are either daft or deceitful. ps. Hope Santa was good to you and your family. 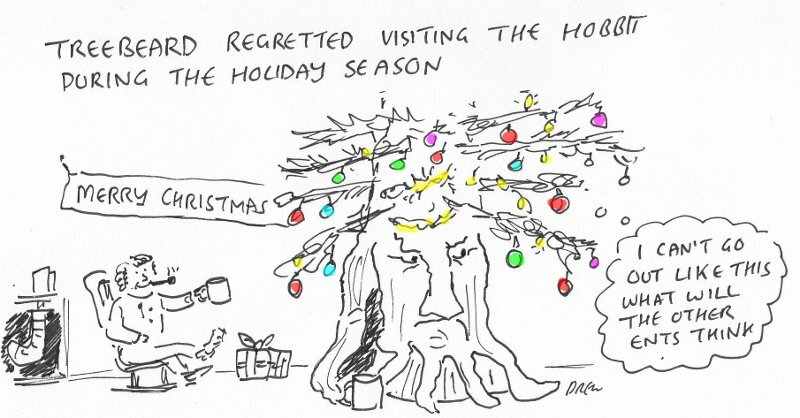 I no longer have an Advent deadline driving daily cartoons but the urge is still there so keep checking in. 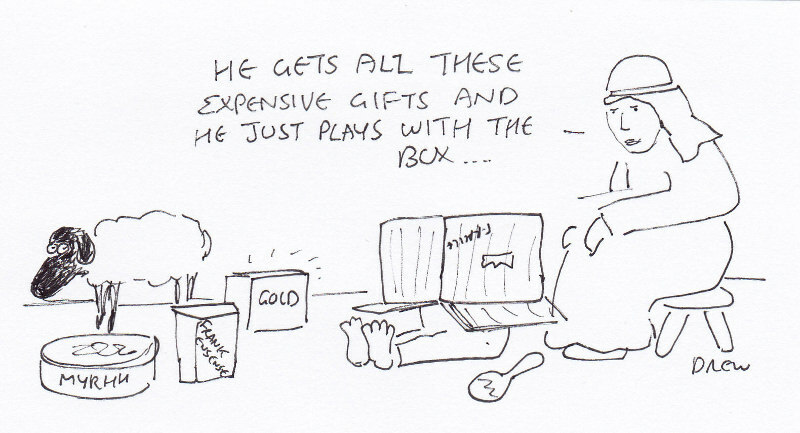 Final advent cartoon I'm a bit emotional. Let me just say Merry Christmas everyone, thanks for reading and come back after your presents and indigestion for more cartoon fun! 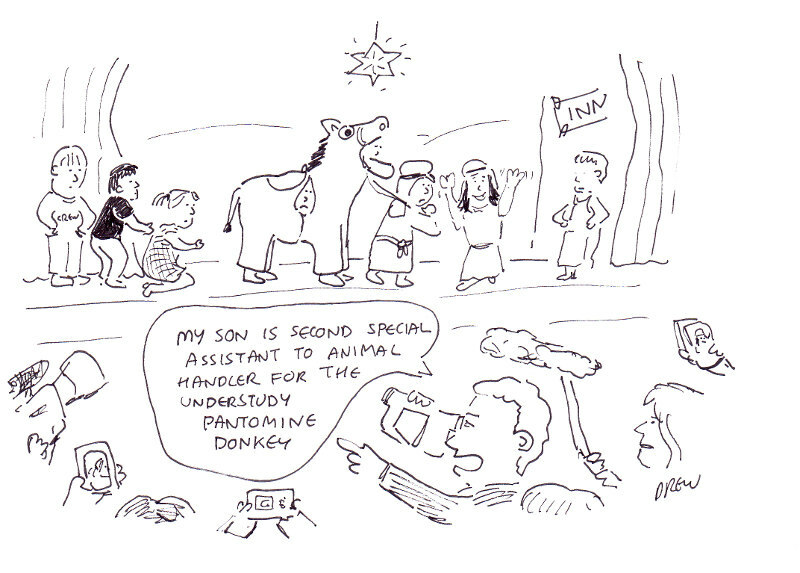 Today's penultimate advent cartoon borrows a joke I saw in the Festive Radio Times. What did Adam say on the Day before Christmas? It's Christmas Eve. 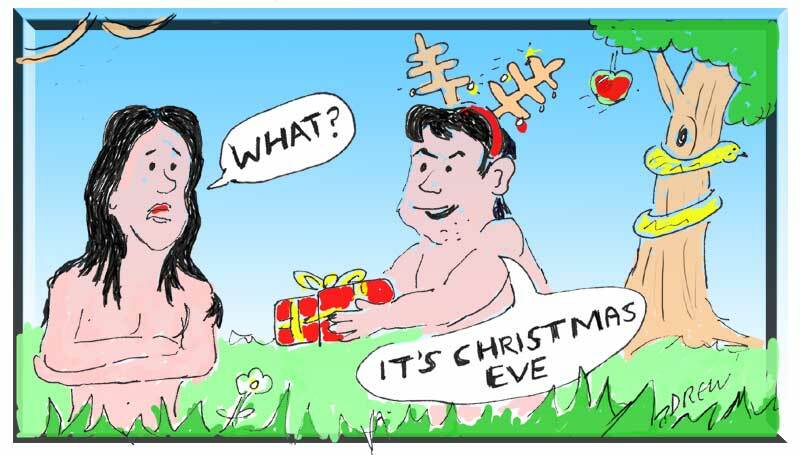 Drawing Adam and Eve celebrating Christmas is like drawing dinosaurs and people together - it couldn't have happened but its useful for drama/comedy. Adam and Eve are also quite popular cartoon characters to draw probably because they are naked. I was disappointed to discover my children's advent calendars ran out on the 24th and there was no double door mega-chocolate for Christmas Day. For this digital Advent I've decided I will do a Christmas Day but I will probably draw it early and release Christmas Eve evening so I can have the big day off with my family without worrying about the Internet and drawing. Is it wrong to go on the Internet on Christmas Day? 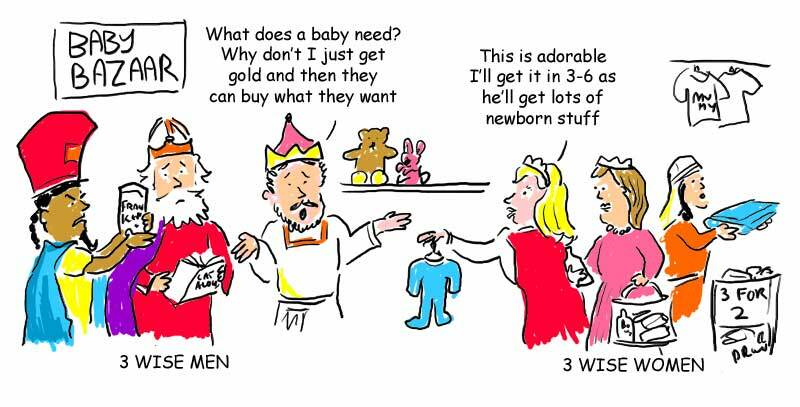 Today's advent cartoon is the follow-up to the Twelve Days Of Christmas. Radio Fours Thought For The Day was talking about how useless the various gifts were today but that we should buy something impractical (like four calling birds - I don't have need for a single calling bird never mind four) to show someone how extravagantly you love them. That strategy is a high risk one that is more likely to result in a trip to a Customer Services department as shown above. I think I ought to like BBC's Thought For The Day being interested in religion, Christianity, philosophy etc but it really irks me instead. Mainly because whatever they are trying to put across, usually by relating it to some modern trend or event very rarely surprises or makes you think at all. So my usual reaction (and I'm probably not alone in this) is to wish they'd simply get to their point so we can get onto listening to something interesting instead. Two more days of advent challenge to go and then after taking a festive break I'll have to find something else to draw. 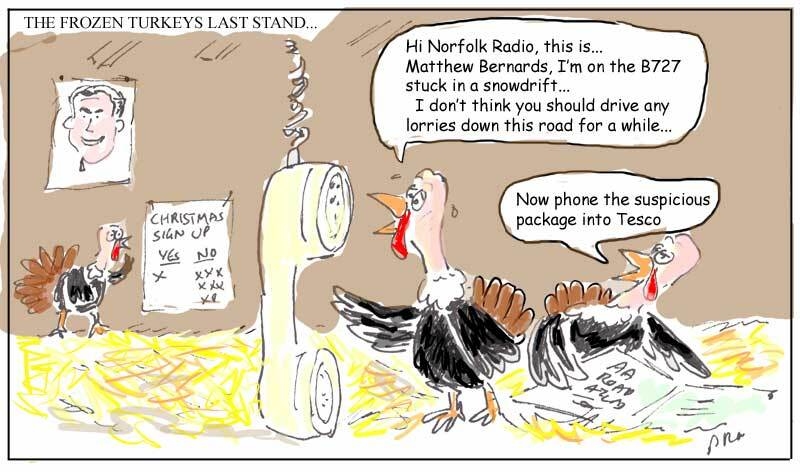 For those outside the UK Bernard Matthews is the UK's biggest turkey producers based around Norfolk whose famous founder died this year. 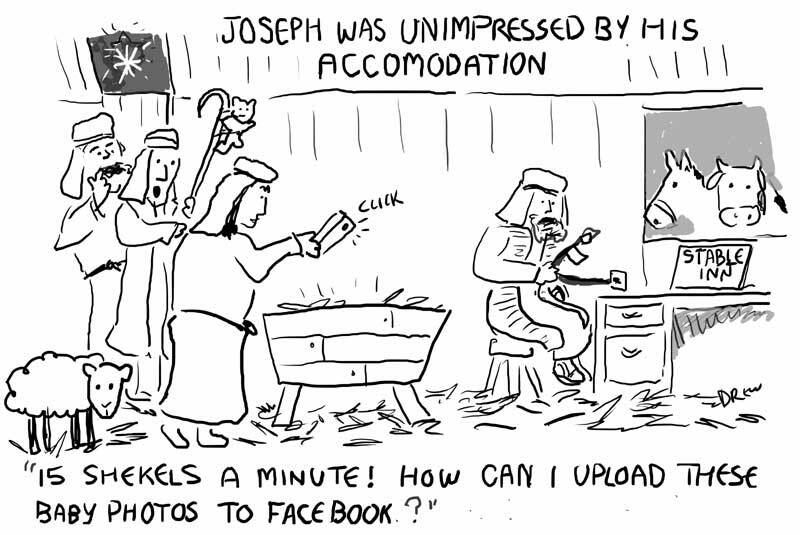 Some folk coming from Facebook only seem to be able to see a single post and miss the other 21 advent cartoons. Now there are some links at the bottom of the page and you can always find the latest posts at cartoonsidrew.blogspot.com so here is an interactive advent calendar. 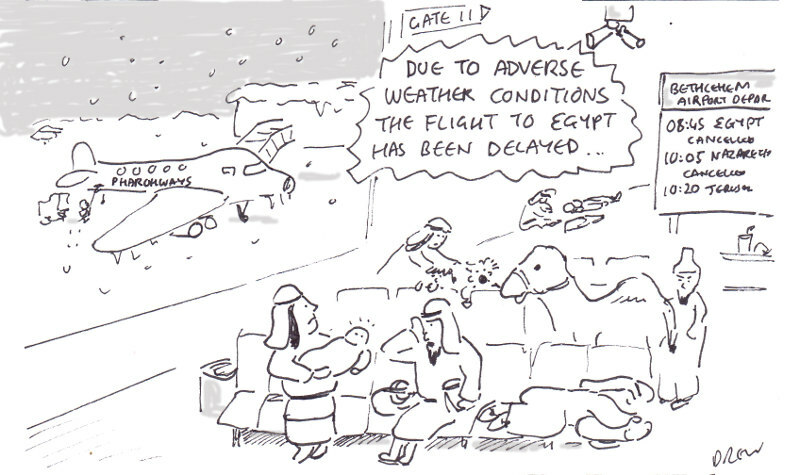 Today's advent cartoon relies on you having paid attention to the end of the Nativity story (as told in Matthew) and living in the Northern Hemisphere where the winter is causing airport and other travel chaos. Away in an airport no chair for a bed... 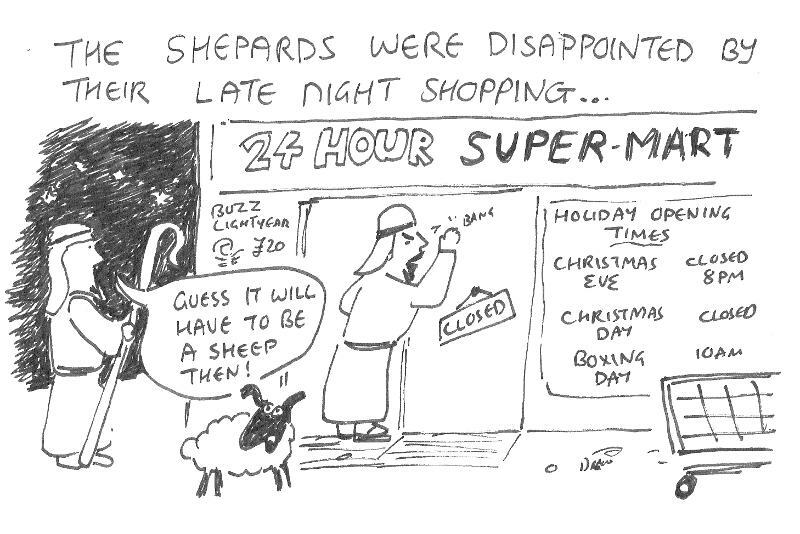 The Christmas story (the Nativity story not the X Factor 'journey' to No.1) is full of hardship and travel. So when we grumble that our none perfect Christmas is not as it should be remember the first one. I spent more time on tonight's advent cartoon which may be wasted if people don't know what a Secret Santa is or if it isn't universal. I quite like the idea of a commercial Santa mirroring the jolly child-serving domestic one and going back to an earlier cartoon commentary on the economic viability of Santa you could see how having the key to every home on the planet could be exploited to also infiltrate business R&D laboratories so you can sell trade secrets to the highest bidder. ps. The mention of you-know-what-Leaks is only for comedy relevance effect and this blog takes no position in the ongoing cyber war. Please direct your Denial Of Service attacks elsewhere otherwise literally a dozen or so people may be disappointed and unable to enjoy their Christmas build-up. 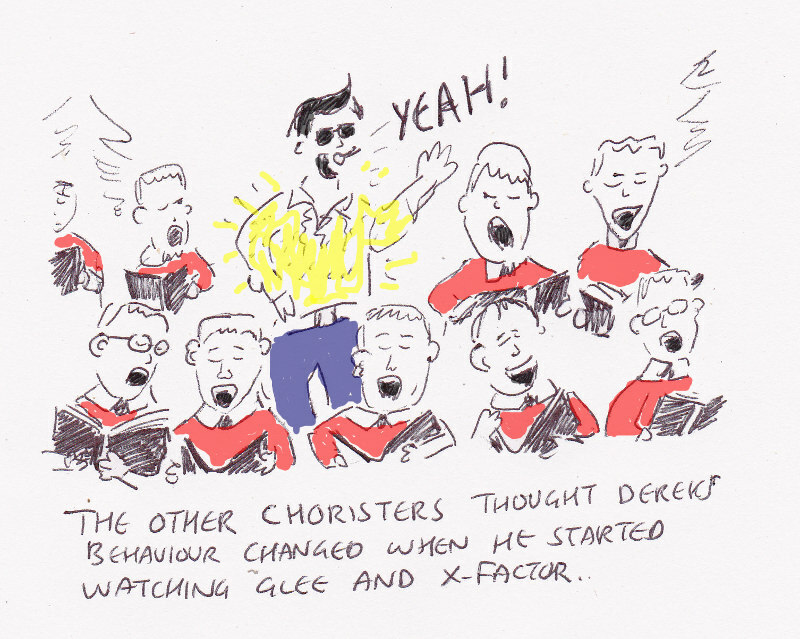 Todays advent cartoon about about Choral singers is a good example of a deadline cartoon, when you run out of time because of in this instance a busy day and Christmas card writing.or Writing Cards and you struggle for an angle and something witty to say. The problem here is not the drawing it could have been refined more. I had a couple of goes at getting those posh * mouths right and its ok. No the problem is the concept/writing. Last night I went with the first viable idea when somewhere in there is a better cartoon/caption even now I could think of something along the Kings Choir, Elvis the King line. However you get tired, time is tight and here is where we end up. It is easier to get away with bad drawing and good writing than vice versa. Indeed cartoons like Dilbert are drawn very simply or the webcomic xkcd uses just stick people. It's tempting to say (like some modern art) my nearly-four year old could draw that without realising there is a skill in saying more than less and I often have to resist making my work too arty. No rather than Drawing I would be better working on my English. So I'm covering up my questionable drawing with lots of English to make up for it. * I write this with the words of one of my English teachers ringing in my ears pulling me up for using the word posh. I received a lecture on the origins of this phrase from cruise liners apparently it stands for Port Out, Starboard Home which the upper classes preferred as that was where the shade was as the sailed to India. My English teachers used to like my creativity but dispair at my speling and grandma. My daughter was Christmas Pie No.5 in her Nursery Christmas concert. There were plenty of pictures and video being taken. A full nativity play must attract more cameras than a full White House briefing unless they are banned. Of course my paternal pride means I would be proud if my daughter was Christmas Pie No.878 - it's the taking part of your offspring that matters. One of the great mysteries of Christmas for Christians is that the Jesus we celebrate being born was both a human baby and God. Vulnerable and all powerful, human and divine. How does this cartoon make you feel? For any normal human child this is simply a piece of observation that may raise a wry smile, but this is no normal child. It's ok to depict the Shepards and the wise men as cartoons but just look at the typical art of Jesus and his mother (google images of Madonna and Child) and you'll see that previous art tends to portray the divine perfect nature of the pair. 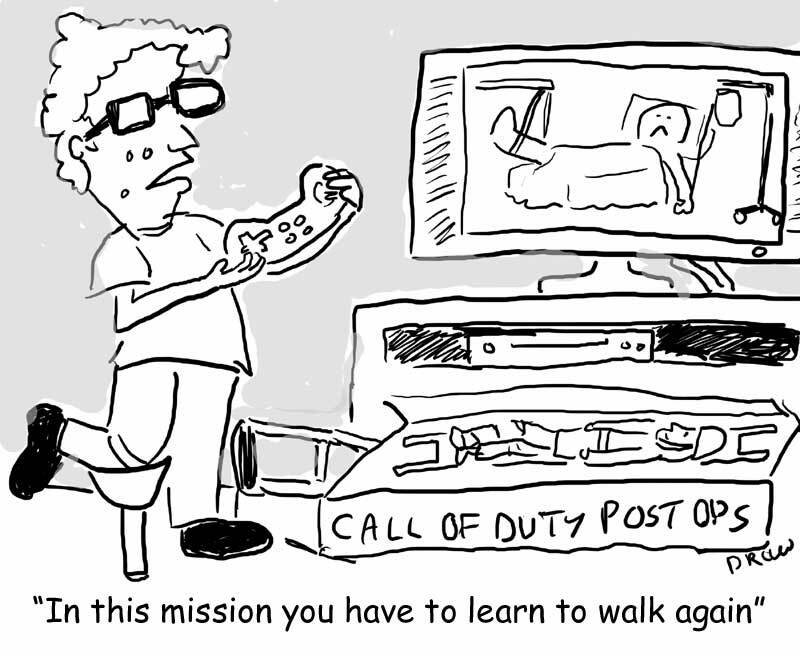 Cartooning tends to want to find humour in situations and relate them to modern times and temperaments. Is the story of Christmas about a perfect child who in the carol Away In A Manger "No Crying He Made" or was he a real kid with a real sense of fun? The incarnation is a mystery Jesus is both human and divine, the Baby of Christmas, the Man of Easter and the Son of God. What do you think? Today our Christmas Tree went up but it was only an artificial one. 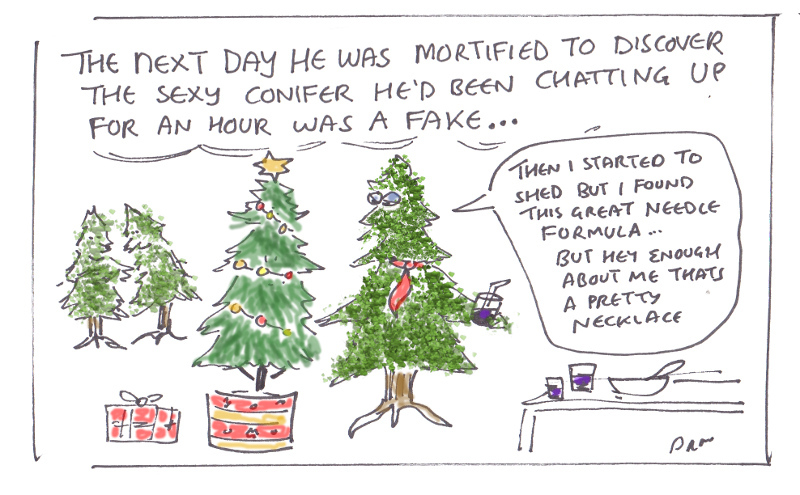 Today advent cartoon explores the relationship between real and fake Christmas trees. Happy Christmas! Happy Hannukah! Happy Winter Solstice! Happy Holiday Season! Have I left anyone out? What about the 380,000 people who stated their religion as Jedi in the 2001 England/Wales census? Surely as serious as they are in their beliefs they will want to be celebrating Life Day as first introduced in the infamous 1978 Star Wars Holiday Special. 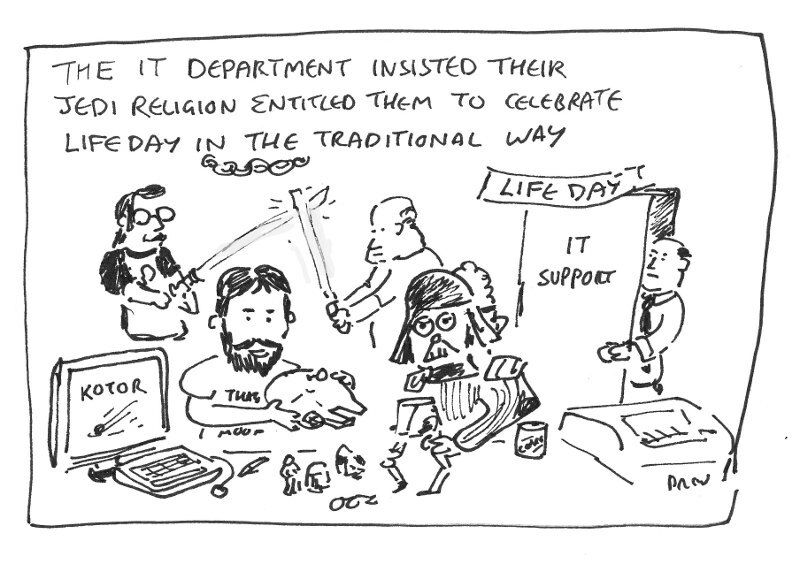 Instead of a serious discussion of what constitutes a religion and what their rights should be in a multi-cultural society lets consider the different forms of religion debate in IT department. Today's Advent Calendar is a regional observation that may be lost on the 48% of Blog visitors that come from overseas. So for their benefit lets recap the situation on the ground in bonny Scotland. It is winter. A fact that caught media outlets and those responsible for preparing for it by surprising partly because it started in November. Hence this cartoon. It is (very) cold. 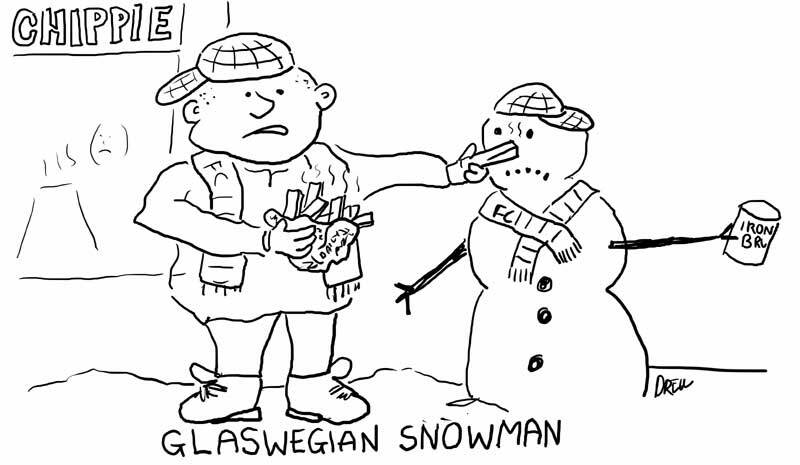 Perhaps not for Penguins, but it is for Scotsmen who as we know wear kilts and no underwear all the year round. It snowed quite a bit on a Monday. Last Monday the Central Belt (the part of Scotland where the people outnumber the sheep) was paralysed by white fluffy snow and many drivers spent long hours (and some nights) on motorways in their cars. It might snow again. After their day of Infamy the weather forecastings are now trying to hedge their bets by suggesting oh no it might snow late this week. Christmas is coming but our parcels aren't. Supermarkets and some online shops have stopped taking new orders for delivery in Scotland before Christmas. 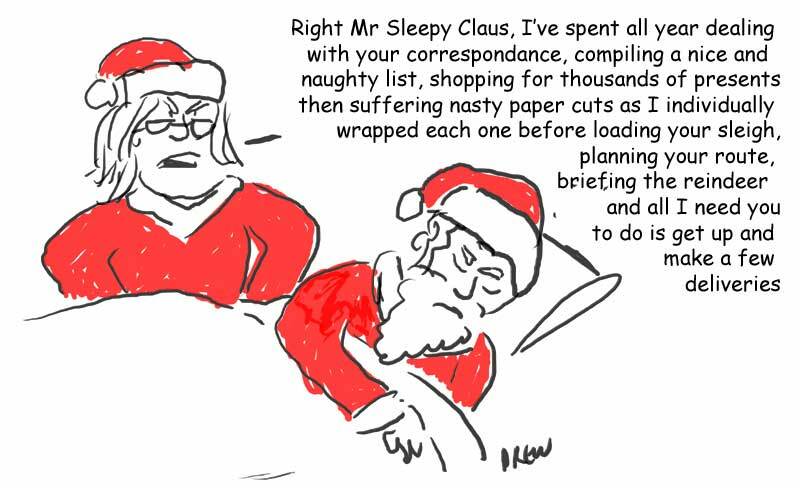 And those whose wives aren't as efficient as Santas or mine are worrying if all their existing Amazon parcels are going to arrive or whether they are going to have to tell their children Santa is stuck on the M8 with half of Postal Force. 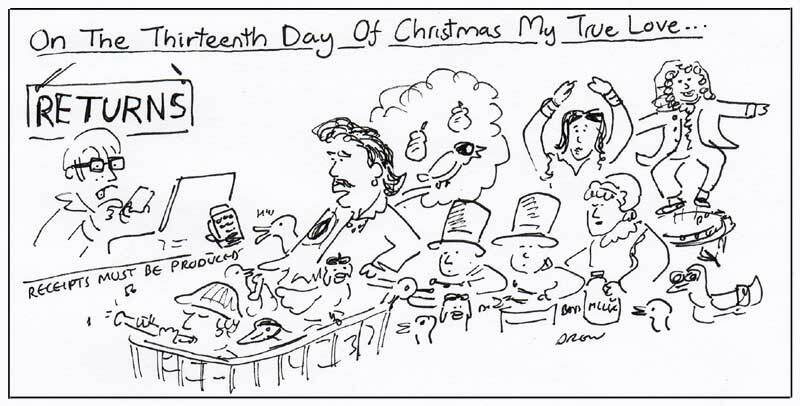 Twelve days into the Advent Christmas Cartoon Challenge have we ticked off all the obvious topics? Yes to Shepards, Wise Men, Manger, Santa, Snowmen and Reindeer but what about Lord Of The Rings? To the undiscerning reader there is no Christmas in the J.R.R.Tolkein's Lord Of The Rings trilogy but dig deeper and there may be a reference in the original Quenya (High Elvish) to ﻿a sort of Teleri version of Life Day. Evidence of this can be found in the long boring poems that very few bother to digest and thanks to the popular but still overlong film versions will soon be forgotten by future generations. Extra Elvish bonus points if you can guess the name of the festive Hobbit. ps. Why is the new Hobbit film being made in two parts apart from the obvious to milk profits? I'm not a fan of the Harry Potter series but I would suspect that the same charge could be brought against the first installment of the last book as well. If you genuinely have 6 hours of material you think the audience want to see then by all means split it across two films but if you have 4 hours just make a longer film don't pad it (if Mr Hollywood Exec you're worried about toilet breaks you can always have an intermission). The traditional nativity scene has the shepards arriving and presenting Mary and Joseph with a sheep the assumption being that not being rich like the Wise Men that was all they had to offer. Had this occured in modern times there would be 24 hour supermarkets stocked with cheap Chinese imports to ensure that at any hour you could find a relevant gift for any event. Had this occured this Christmas then it would be subject to weather disruption and lorries and what hours the stores were open for over the holiday season. It reminds me of the old Steve Wright gag where a guy goes to the 24 hour grocery and finds the guy locking the front door. 'I thought you were open 24 hours' he said. 'Yes, but not in a row'. I like drawing Rudolph, I always did. He has a great big nose and TV aerial antlers. There is an error in the title it should read "he didn't know what he'd be doing the..." not "he'd been doing". When I am less busy making birthday cakes I will fix this. Penguin Facebook you heard it here first on Cartoons I Drew my latest Web 2.0 money-making idea. There are surely already pets on Facebook and other social media why not all animals? Of course here I'm speculating about how very similar penguins would communicate if they had the right equipment. What about Fishbook where goldfish can post the same status updates every 10 seconds because they forgot what they just wrote? 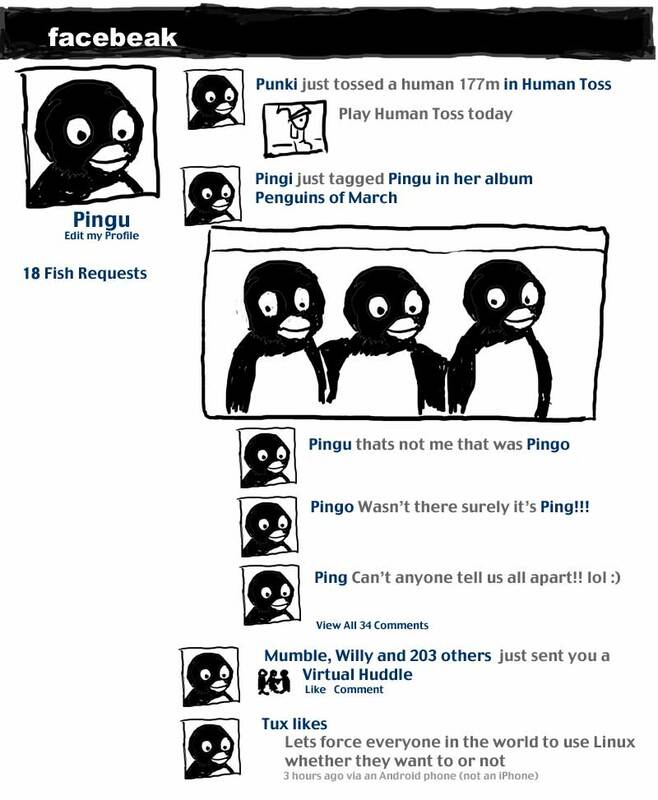 Anyway here is Pingu's page. He is my hero because he is currently on BBC2 at 6am most mornings which is as early as we will tolerate my young kids getting up and he amuses them while they drink milk and I look at human Facebook and this excellent blog. Good King Wenceles Car Clearing Carol from day 1 - does it owe it's position to merely being the first cartoon? After studying at the Angel Room ceiling at Overtoun House I started to look at the Art History of angels and why they are portrayed as women or babies with wings. What I learned is that everything mentioned in the Bible about Angels (the Greek or Hebrew word simply means messenger) doesn't lead you to an easy portrait of what they look like except they were frightening to behold. The paintings, cartoons and tree ornament depiction of angels comes more from Greek and Roman mythology reinforced by great Renaissance artists like Raphael, Michaelangelo and Titain. Take Cupid the Roman god of Love (Eros to the Greeks) often portrayed as a naked winged child. If you took away his arrows and Valentine hearts he would look positively angelic. Or Victory the Roman goddess of victory (Nike to the Greeks) a winged female figure appearing from above to crown victorious generals and athletes with a wreath. When Christianity became the official religion of Rome the artists basically looked to the old ways for inspiration on how to paint these new celestial beings. Do Angels have wings? Some do like Cerubim (Ezekiel 10) and Seraphim (Isaiah 6) but in early Christian art they were generally 'wingless'. Are Angels men or women? The Bible doesn't give them a gender but they often appear as men. Do they play harps? Maybe it can be inferred from Revelation 5:8. If all this seems a little in depth don't worry I pulled alot of it from a document I wrote several years ago which joined two interests of mine Art History and Christianity. 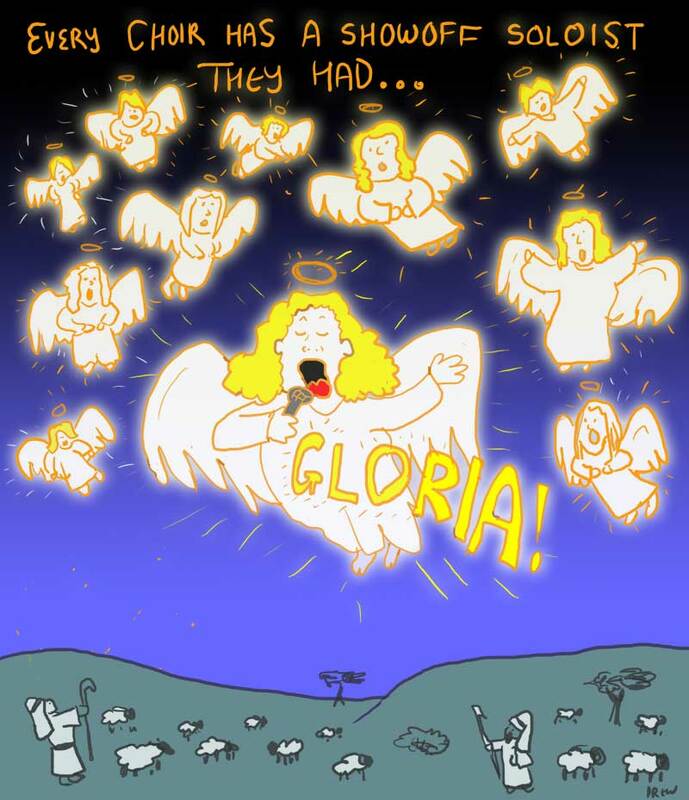 Todays cartoon is just a play on the long 'Gloooooria' we sing in carols. Its also a bit of an experiment in Photoshop layers. Yesterdays Mrs Claus cartoon led me to think about other potential members of Santa's family in particular being the child of Santa Claus. Imagine if your father is loved by children all over the world and buys them very special presents but is so busy during the festive period he forgets to get anything for you. Don't worry this is not therapy, and that is not my father but if anyone wants to turn this idea into a screenplay, film or book remember to credit me. If I was to draw a pie chart of the male/female gender split of Christmas workload I would reckon I contribute about 5% of the overall effort a fact I'm sure my wife would agree with as she goes off to finish writing our Christmas cards, hang up the washing and all after 5 hours in snowbound Glasgow gridlock. Indeed she is so indispensible she even pointed out an error in my caption I would have missed. ps. Dear Google if you insist on improving the Blogger experience with your funky new Google Cloud Picker for uploading images at least give us something that's not a beta version that comes up with an error message everytime you try and use it. The best workaround to this found by Googling is to clear your cache and cookies and then it did work the old way again. pps. I still love Google so great and powerful corporation do not stop your benevolent robots crawling thy humble servants site and directing random searches here just because of the previous criticism. 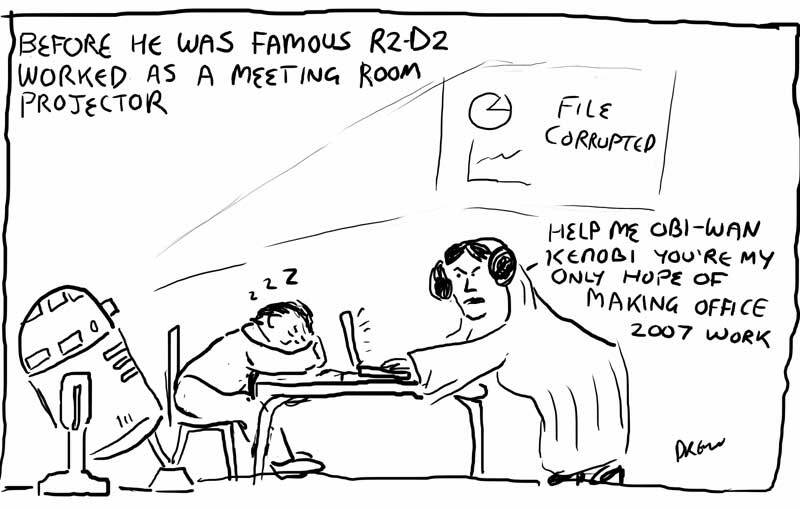 Everyone knows how The Empire Strikes Back Begins (if you don't todays cartoon may not be for you). The evil lord Darth Vader obsessed with finding young Skywalker, has dispatched thousands of remote probes into the far reaches of space..."
To summarise destroying the first death star does not defeat the Evil Empire (so why does destroying the 2nd one in Return of the Jedi?). As everyone knows the not-at-all-like-nasty-terrorists rebellion flees it's lovely leafy base on Yavin IV to end up on the ice world of Hoth where the temperatures are so extreme even FIFA wouldn't host a World Cup there. 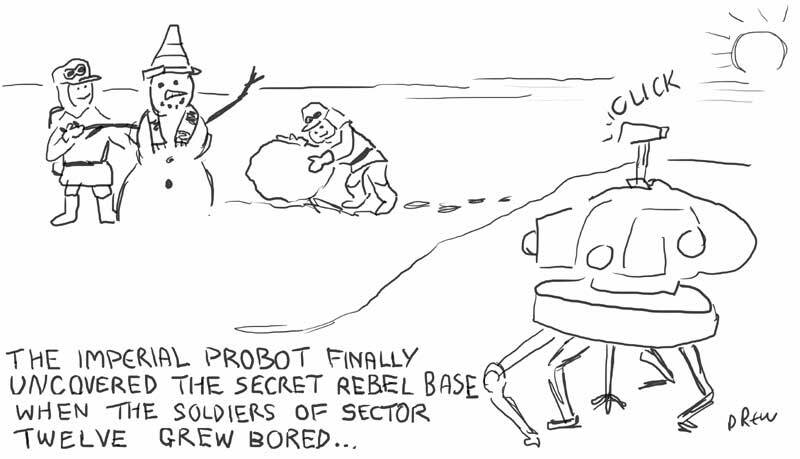 So if you have a secret rebel base which the Emperor is looking for with lots of spidery robot probes (or probots) why on earth did they put it on the surface of the planet with buildings and guns defending it? It would be like Bin Laden putting a big neon sign saying 'America's Most Wanted' outside his secret cave in the Tora Bora region of Afganistan. I prefer my alternative opening where the frozen rebel solders of Sector Twelve whining about their incompetent leaders who with thousands of habitable planets in the galaxy chose a frozen wasteland try and have some fun and get spotted. It would have to be either that or some bored droid leaking their whereabouts on Twitter. Every (rare) recent visit to a hotel or B&B leaves me astonished at how much they charge for broadband rates when places like McDonalds somehow give it away free. Ok so if you don't get it consider that a Glasgow Salad is chips. If you still don't get it there will be another cartoon along tomorrow. Why have no tech-savvy kids tried this? They must have clocked the fact that Santa must be the richest man on the planet even though he appears at every shopping centre and kids party in variable quality of suit and beard. Why he is a bigger entrepreneur than Alan Sugar who if he let his beard grow out a little could maybe pass as Father Christmas. At this time of year there is much debate about the scientific plausibility of Santa's sleigh traveling round the world's infants in one night at either super-sonic speed without melting the reindeer or sub light speed where the almost glowing light from Rudolphs red nose will turn green due to special relativity. 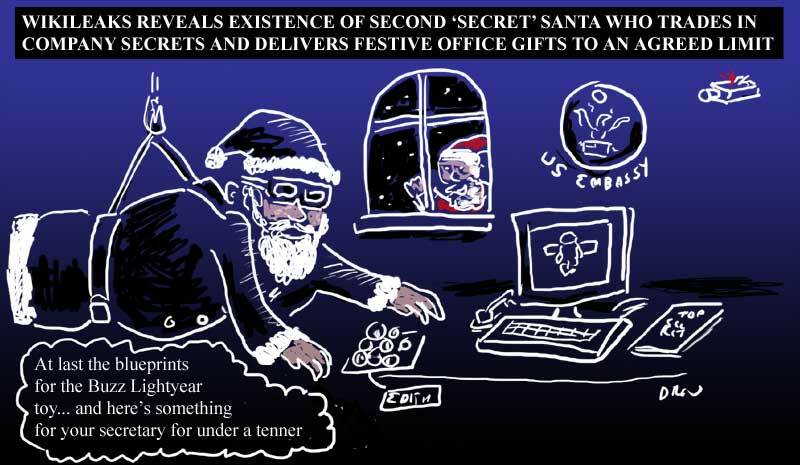 However we don't often consider the economic implications of Santa. The richest man on the planet is Mexican Carlos Slim Helu worth 53.5 billion dollars (53,500,000,000) only slightly ahead of Bill Gates at 53 billion. According to UNICEF there are 2.2 billion children out of a global population of 6 billion. So if Santa spent * just 25 dollars per child (16 pounds) which wouldn't get you a Barbie doll never mind an iPad, he would have to give away as much money as the richest man on the planet is worth every year. So where does Santa get his money from – is his selling the Artic drilling rights to the Russians or does he have a lot of credit? Maybe he is league with the Tooth Fairy who is probably dabbling in the derivatives and currency markets. * I know Santa is meant to manufacture his own goods with his high-tech, minimum wage legion of elves but if you look at your children's toys then they are all made in China or Taiwan. Also you could argue that Santa could economise by spending less on children in the developing world but due to inflation and consumerism the amount spent on kids in the richest countries is much more than 25 dollars. Doesn't the naughty/nice list disqualify some proportion of the 2 billion children? This is contraversial I know but I believe the naughty list is merely a fiction invented by parents to rein in hyper kids in the advent period. Do naughty kids ever end up with no presents on Christmas morning? 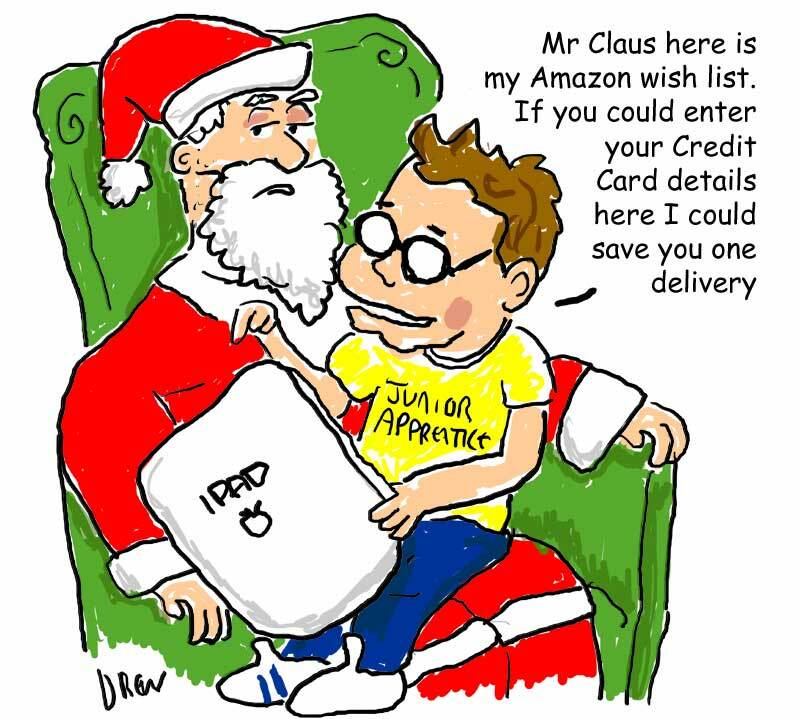 Furthermore do you ever see Santa turn away a kid at one of his grotto surgeries or inform them that they are too bad to get anything. What about children that don't believe in Santa, are from other religions etc... Come on it's just a silly blog posting. Yonder market, where is it? Where and what its selling?" Else we'll get much thinner." 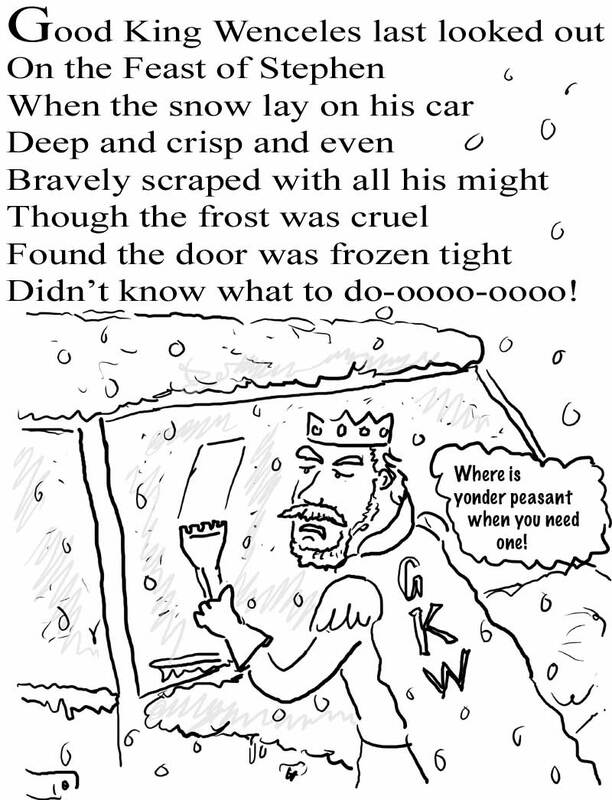 For those interested in the original lyrics Google 'King Wenceslas lyrics' or try this link which discusses whether it is a proper carol and whether is belongs in Christmas, Boxing Day (Feast of Stephen) or Spring. 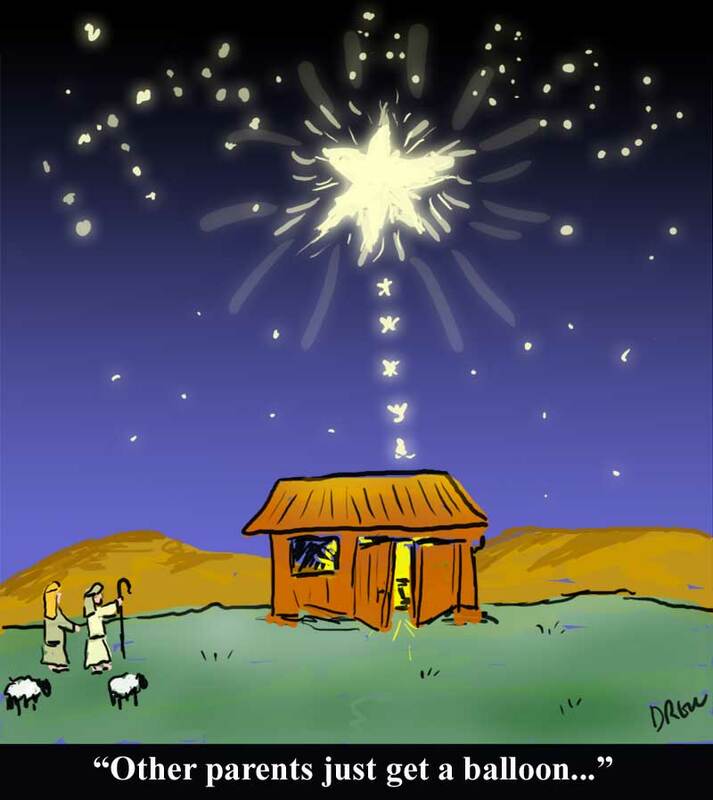 Today is the start of advent - check back for some old and new Christmas cartoons! 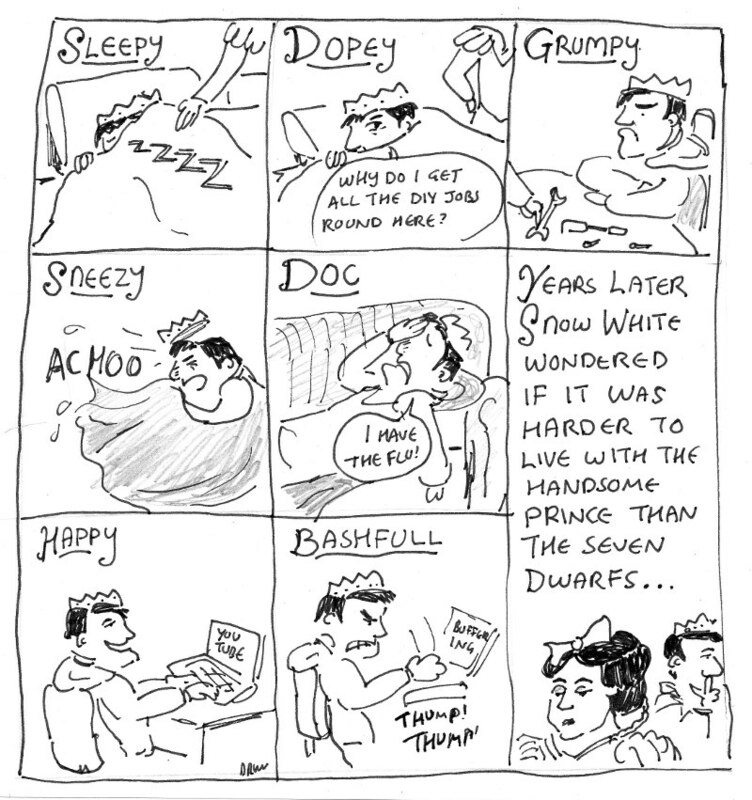 Following on from my Sleeping Beauty cartoon comes the Happily Ever After of Snow White. 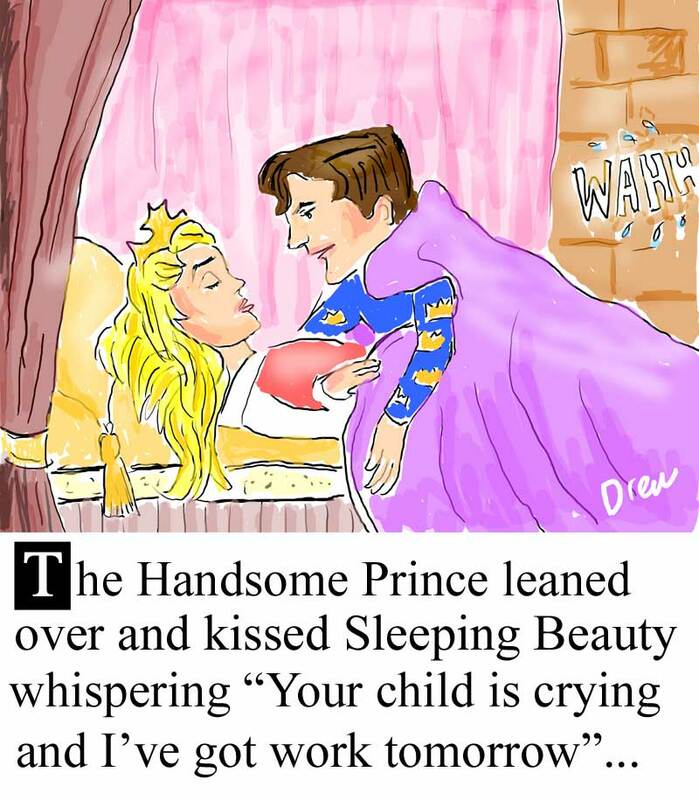 My young daughter is into princesses and so everything in my world is pretty princesses and handsome princes. Sometimes however I feel more like the seven dwarfs. ps. Why is it dwarfs not dwarves? Google and Disney favour Dwarfs but surely the English language with the support of linguist Tolkein should properly be dwarves. 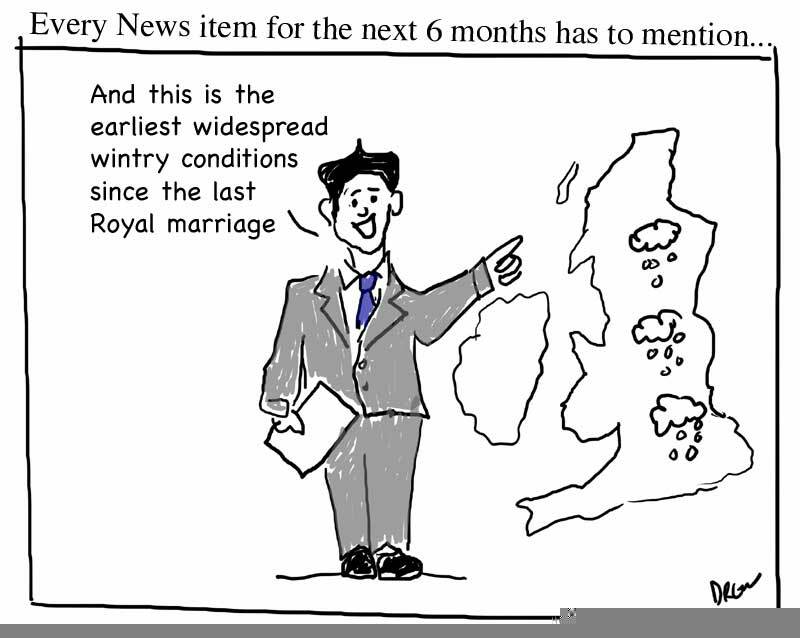 Today's major BBC new story was the startling revelation that after months of warmer weather we are entering a period of what the meterological experts call Winter. During this terrifying season normally benign precipitation falls as frozen 'snow' creating endless galleries of pretty landscapes and talk of traffic gridlock and on Radio 4 the harsh realities of the so called 'Grit Wars' (apparently Grit Wars are more likely to trigger a Third World War than events on the Korean peninsula). On top of this is the chilling statistic that this is the earliest widespread snowfall for 17 years. A whole 17 years ago that's the previous century! Also it isn't even the heaviest snowfall it is the earliest widespread snowfall which seems a rather strange slant on what is just a bit of snow falling at the start of Winter. Students riot over proposed Coalition plans to raise tuition fees - William and Catherine met at a university where they had no problem at all with tuition fees. Conservative peer Howard Flight complains that the Middle Classes are being put off having children by child benefit changes - will William be eligible for child benefit when they happy couple think about kids. Star Wars and Tech Support together for not the first time! Every Star Wars movie begins with the line "A long, long time ago in a galaxy far, far away..." meaning that the universe of Darth Vader and Han Solo is infact ancient and if we were able to go there now the technology would have advanced far beyond anything George Lucas could imagine. Maybe they'd use missles not laser swords and maybe if a Princess needed to send a important message to a retired Jedi she'd use Facebook or Twitter without requiring a droid courier. Tonight is Children in Need but in my current sleep deprivation I'm proposing a new telethon "Parents In Need" in which members of the public can sponser my kids to sleep through the night (beyond 6am). "You can't even carry a barrel around these days since that Guy!" ﻿ ﻿Tonight is Bonfire, Fireworks or Guy Fawkes Night a strange UK custom that dates back from November 5th 1605 when a plot to assasinate the first monarch to rule over the newly formed union of England and Scotland was foiled. Guy Fawkes was the plotter found underneath the House of Lords with 36 barrels of gunpowder after an anonymous tip-off. The plotters were all hanged and in celebration a law was passed in Parliment that the 5th of November was to observed with special services and sermons. That act may no longer be in place but we still celebrate the 5th with bonfires and fireworks that some inconsiderate people are still letting off late into the night. I find it odd that this day is still remains in our calendar, that we still want to burn in effigy a Catholic terrorist who plans for a spectacular failed. Today we are fed regular reports of failed terrorist plots none of which merit a holiday merely more inconvience when we do go on holiday. It is tempting to compare Islamic terrorists today with what todays media would label a Catholic Fundamentalist cell but it is too easy to fall into the trap of rewriting history to try and present a completely foriegn world as something modern. My Guy Fawkes cartoon doesn't try and make light of the horrors that terrorists plan but rather observe that the main effect it has on us is the measures we have to put in place to prevent it. 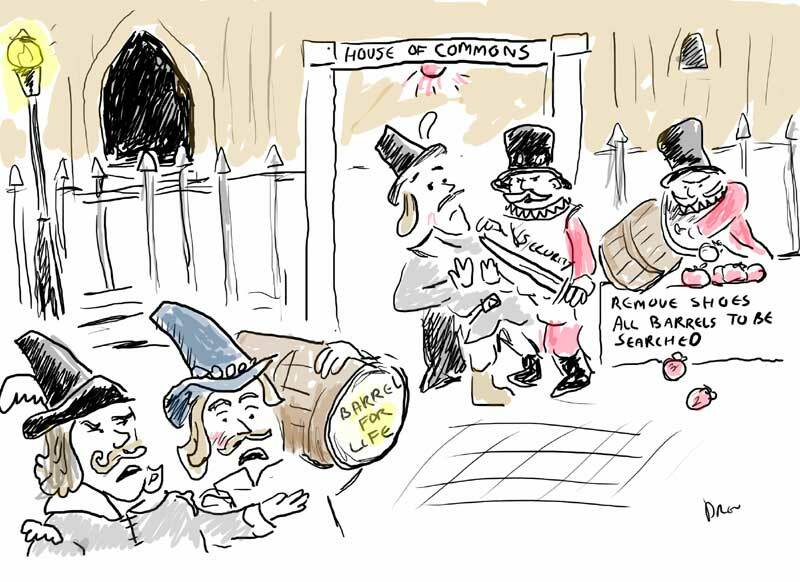 For a lighter take on Bonfire Night Matt's cartoon today is excellant. Right now American voters are going to the polls in the mid-term elections. It is hard on this side of the pond to have an informed opinion when all the coverage is about you wacky Americans and your crazy right-wing Tea Party. We have tea parties in my house too but they are altogether different affairs with yellow and pink cups, and the rhetoric while still fairly fierce is about who can sit where and when you're allowed to have your cake. 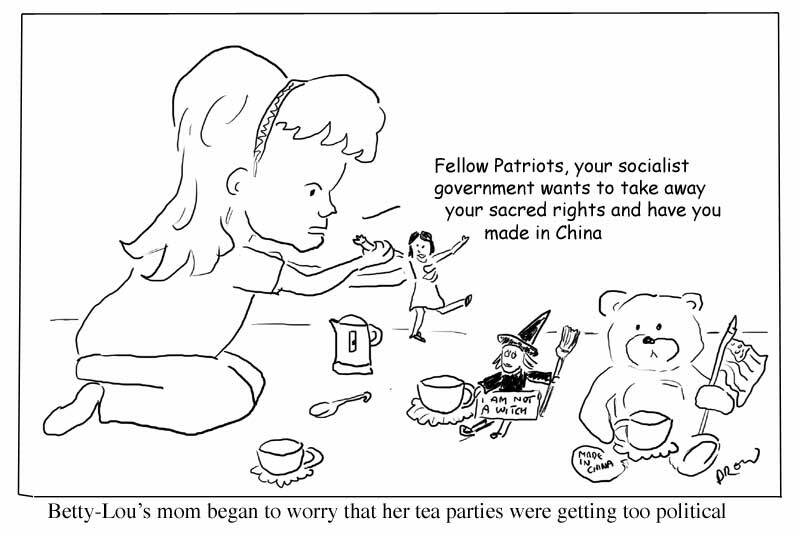 The BBC came up with a piece about UK vs US tea parties but I'd already had this idea before I read it. No-one banged at our door tonight but usually we don't answer anyway. Halloween is a curious mixture of paganism, kids and candy and I won't go into my thoughts on that here. What do we really find scary these days? Apart from things that go bump in the night I offer these three new horsemen of the Apocalypse. Apologies for invoking a laser printer for global terrorism but out of the three that does concern me the most just now. If we can't trust shipping electrical goods round on planes then alot of business including the one I work for is going to have problems. I have some experience of how stringent US customs can be - what more will they be forced to do? After a week of posting topical cartoons that no-one knew about I now throw open the blog to anyone who knows me on Facebook and is bored enough to hit the link. I am still trying out ideas, subjects and techniques. One thing I'm always wary of is by nature cartooning simplifies complex things into simple shapes and stereotypes that have the power to offend or be misunderstood. 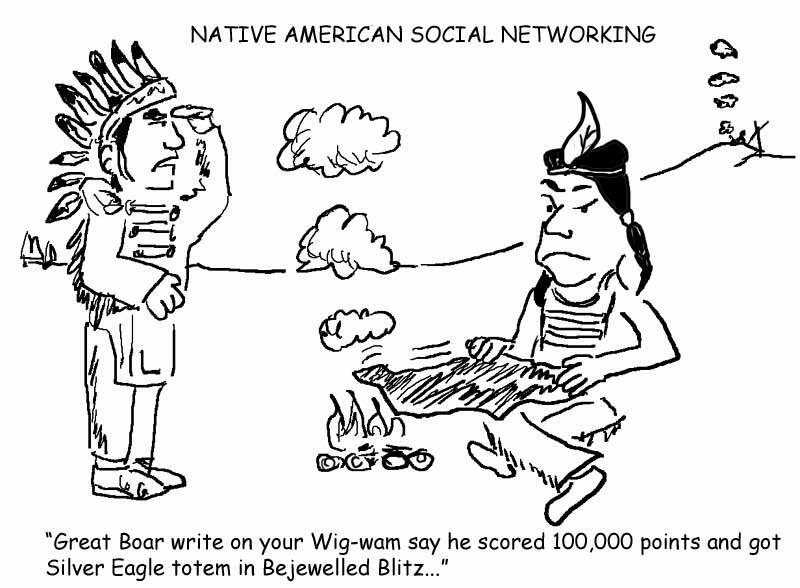 Take todays cartoon, in order to portray a Native American (deliberately avoiding Indian here) you have to draw a stereotypical Indian with feathers and other racial features in order to make what you have drawn understood.﻿ Add to this that you are publishing on the global World Wide Web where people can respond anonymously and you tread a fine line between trying to be funny and trying not to be misunderstood or tactless. 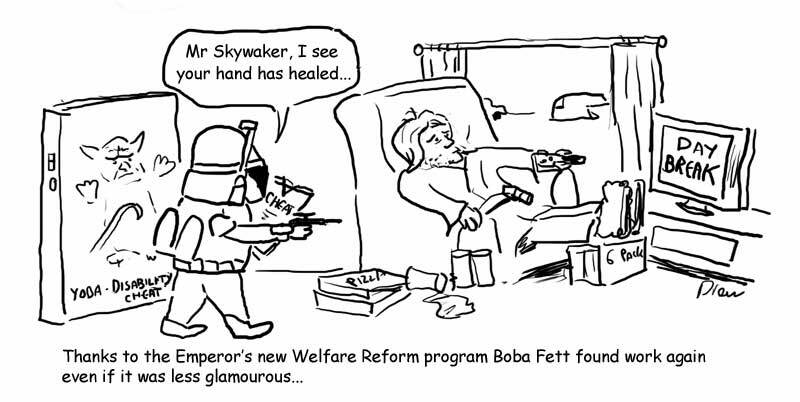 Returning to the Star Wars austerity theme heres my take on a news item for a few weeks ago when as part of welfare reform The Coalition (sounds almost as evil as The Empire) private companies were to be given contracts to track down benefit cheats. For the millions of readers of this blog (Google why does it take so long to be listed in your search engine!) today I have experimented with drawing entirely on my A5 Wacom graphics tablet. Partly this is cleaner and partly it gives me thick lines when I need them as opposed to the thick punchlines which I'm more than capable of coming up with myself. Following on from yesterdays post it appears that Paul the Octopus will star posthumously in a documentary about his life including a conspiracy thriller from Jiang Xiao Who Killed Paul the Octopus? that claims he died before the World Cup Final on July 9th and the Germans replaced him with an identical octopus. Given the wide media coverage of this celebrity cephalopod I thought of other programs he could star in. 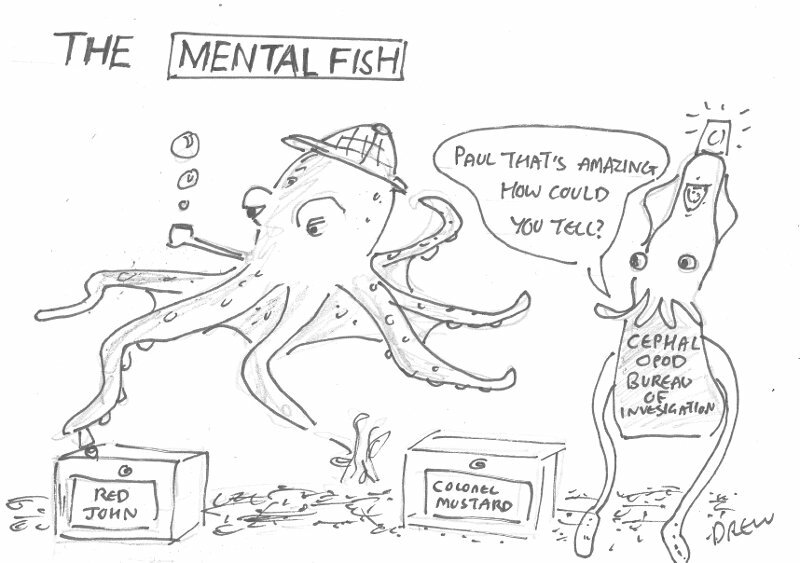 The obvious choice was some sort of maverick detective series where Paul plays a psychic on loan to the Cephalopod Bureau of Investigation to solve the crimes that non-maverick detectives can't fathom (apart from the mystery of his own death). So I give you MentalFish (bad pun - but there are others at the end of this post). Creative: How about a lead that was a bit of a maverick? TV Exec: I think I've heard enough. Creative: So you've had an idea then? "Right here he predicts the double-dip recession of 2012 and President Palin's invasion of Russia!" ﻿The number one story on the BBC news website earlier this evening was Paul the Octopus dies in tank in Germany ahead of economic growth forecasts and an Indonesian tsunami. However this serious news was later overtaken by news that Lady Gaga had beaten some other pop sensation to have the most views on YouTube ever. Over 100 Indonesians die after an earthquake off the coast of Sumatra but we are transfixed by the unexpected death of a clever cephalopod who correctly predicted the outcome of 2010 World Cup matches. However the odds of predicting seven matches is only 1/128 hardly the same as guessing the winning UK lottery numbers. Nevertheless "he enjoyed a good life" according to the Oberhausen Sea Life centre manager and there is a documentary, books and toys planned for the Christmas market. 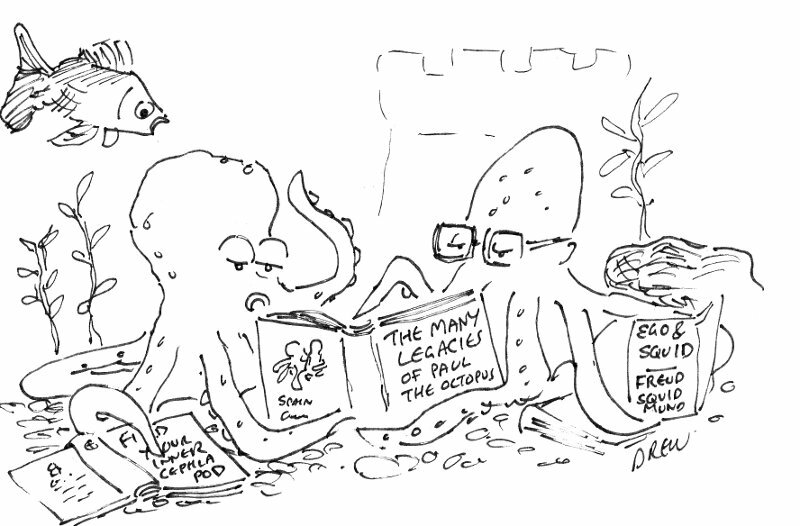 We can only imagine what his legacy will be amoungst his fellow molluscs. Maybe he will be regarded as the Nostradamus of the underseaworld, or maybe his intelligence would not be regarded as that special by his peers who never got their 15 minutes infront of the cameras. Another Naval Carrier reference ... with a Star Wars Twist. You can't work in IT without an indepth knowledge of either Star Wars or Star Trek. Only last Friday we were discussing whether it was physically possible to build a real lightsaber not just one of those pretend tubes or the telescopic plastic ones. However given the Jedi worship of Star Wars amoungst geeks you'd have to think if there was ANY way to make a real lightsaber someone would have done it and been making a fortune by now. "Well Wayne it could be yours for 10,000 easy weekly repayments of 250mil and I'll throw in 3 months sea tax and a Merlin ASW helicopter"
Wayne Rooney﻿ has been rewarded for his disloyalty with a new five year contract at Manchester United allegedly worth 250,000 per week. This despite his disappearing act at the World Cup and a very poor contribution to my fantasy football team. I think this is the least he can do to repay the country. 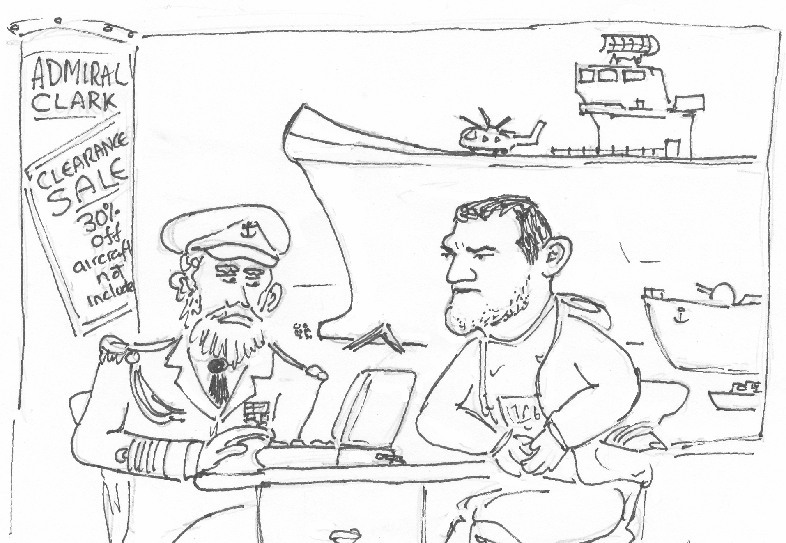 Continuing the Navy and Matt theme from yesterday the building of more aircraft carriers than we need is another easy target of comedians everywhere and here is Matt's Rooney/Aircraft Carrier cartoon. My father works for one of the companies building the carriers and was in no doubt that they couldn't be cancelled due to contracts already signed. Indeed earlier this month we were at the launch of HMS Duncan and we could see huge sections of the carrier already underway in the hanger. The launch of the first Queen Elizabeth class carrier is going to be another field day for cartoonists but certainly not as satisfying for the people who built it as it should be. The story of the hi-tech British Royal Navy sub running aground on Skye is easy comedy and cartoon fodder. 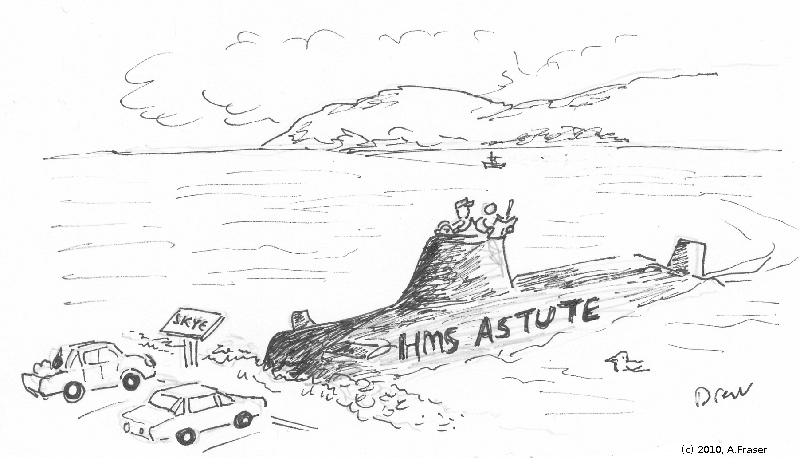 The fact it's called Astute and it can't do a three point turn in the Western Isles tickles me. 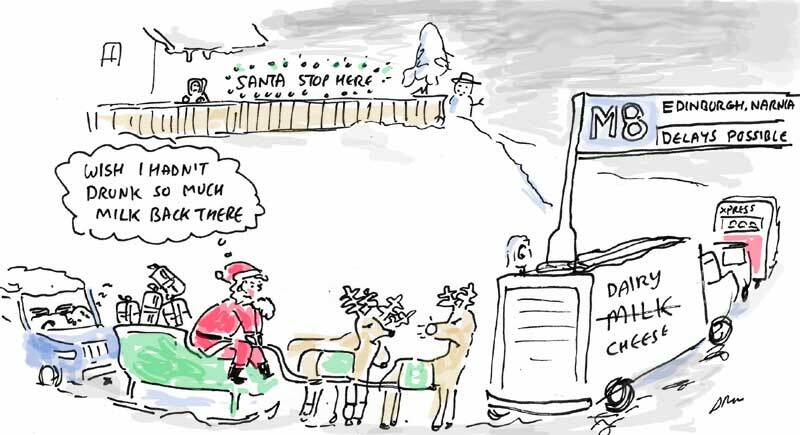 Check out the Telegraphs Matt cartoon on the same story. He is a master at combining two news stories into one panel.